Not from a Box: Hot pot! 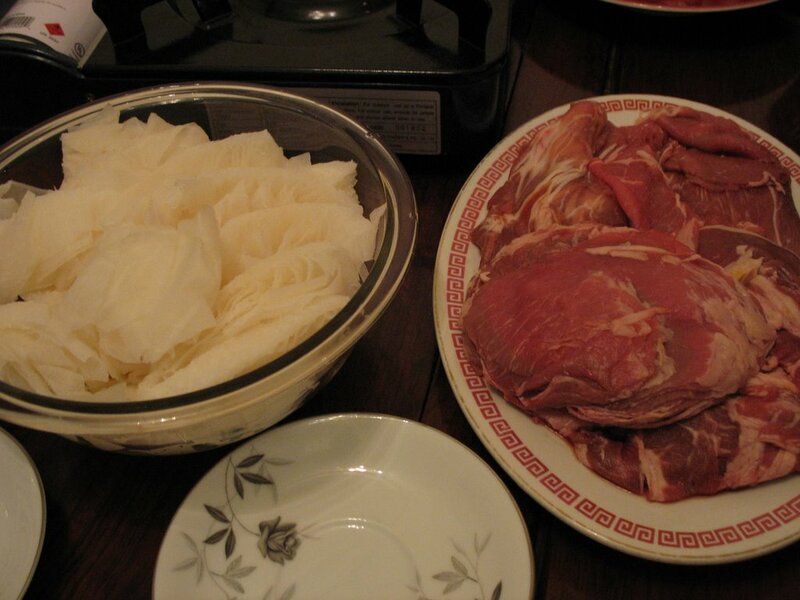 As if I didn't already eat enough on Thursday (which I will post about soon), I went to Anna's house in San Francisco on Friday for my first experience with shabu shabu, or hot pot. 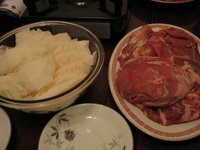 The concept is really very simple: make a broth, drop thinly sliced meats and other goodies into the boiling soup, remove when cooked, dip in sauce, and eat. Despite its simplicity, I had to ask, "What do I do now?" a number of times before getting the hang of it — but only because I wanted to make sure I was doing it "right." 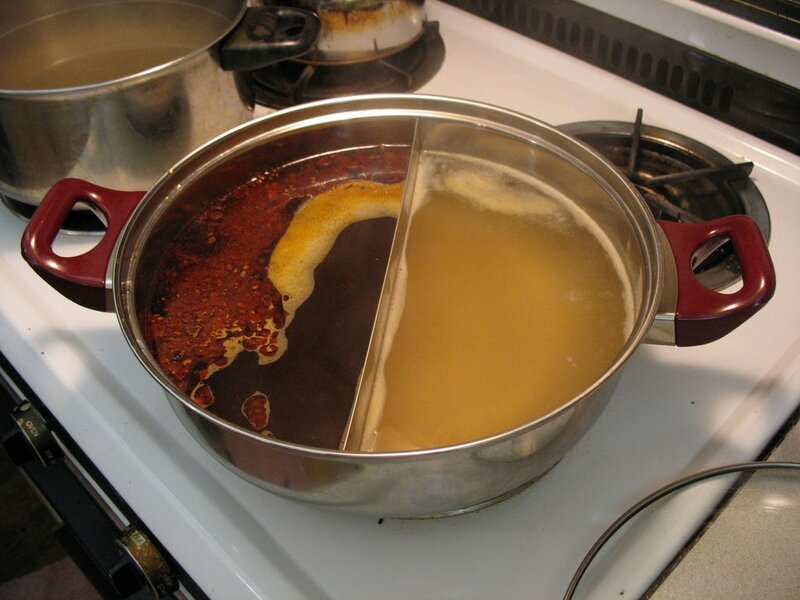 Anna had a couple pots of broth, one of which was split into two kinds: spicy and not spicy. I never did try the spicy, which I'm telling myself is because I was sitting in front of the large pot of not-spicy. It may really have been that, while I do enjoy spicy foods, I did watch Anna put quite a bit of spicy (whatever it was) into the broth. 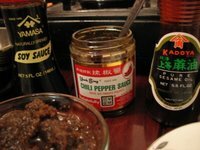 When I first sat down, a number of condiments were passed to me. "For the sauce," I was told. Unsure of what sort of "sauce" I was supposed to be making, I figured I'd go with what I knew tasted good. Into my little bowl went some soy sauce, sesame oil, and fish paste. 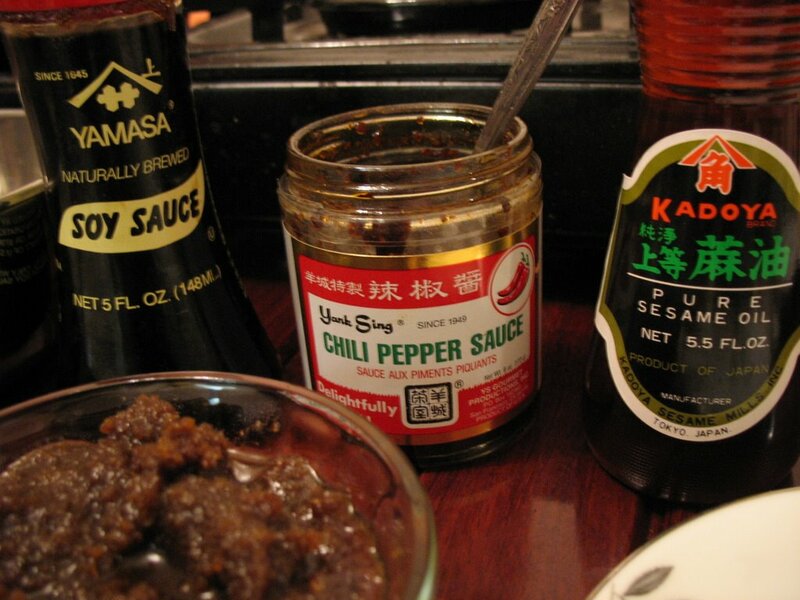 Some sriracha went around, as well as rice vinegar, but neither one appealed to me. 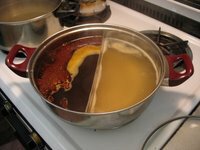 I guess I did a decent job of it, though, because my food tasted excellent after being dipped in this concoction. 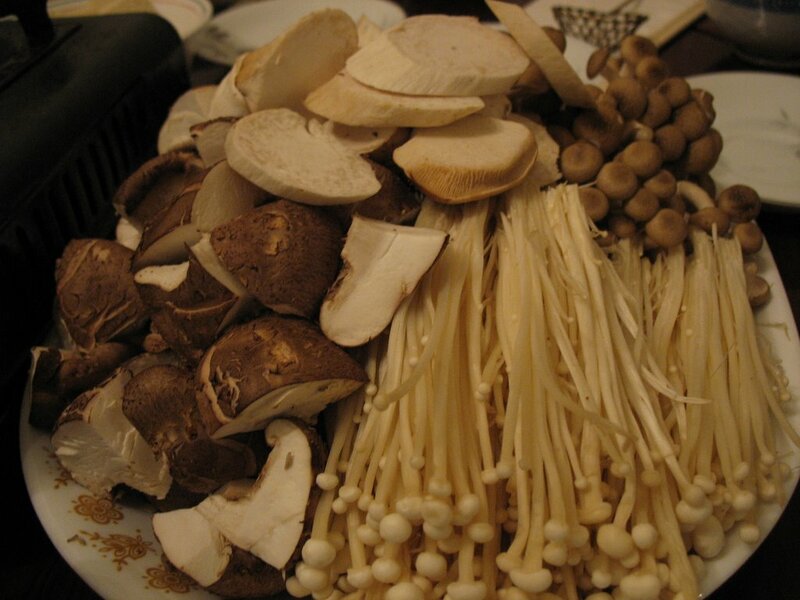 Then came the main ingredients: thin slices of lamb and beef, rectangles of freshly-caught freshwater salmon, cubes of tripe, won tons made by Anna's mom, muscles, scallops, shrimp, balls of both the fish and beef tendon variety, tofu, and several different kinds of mushroom. And that was just to start! After all the meat came veggies: watercress, napa cabbage, lettuce, and mustard greens. 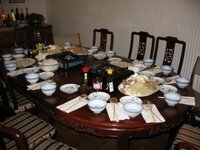 Finally, little bundles of rice noodles were tossed in, to soak up all that broth. Of all these delicacies, my favorites were the won tons, tripe, enoki mushrooms, and watercress. Retrieving these morsels was an adventure. After dropping them into the bubbling water, I then had to scoop them back out using a small metal net on a long handle. It was much like fishing, especially when there was so much in the pot that you weren't guaranteed to find what you were looking for right away. 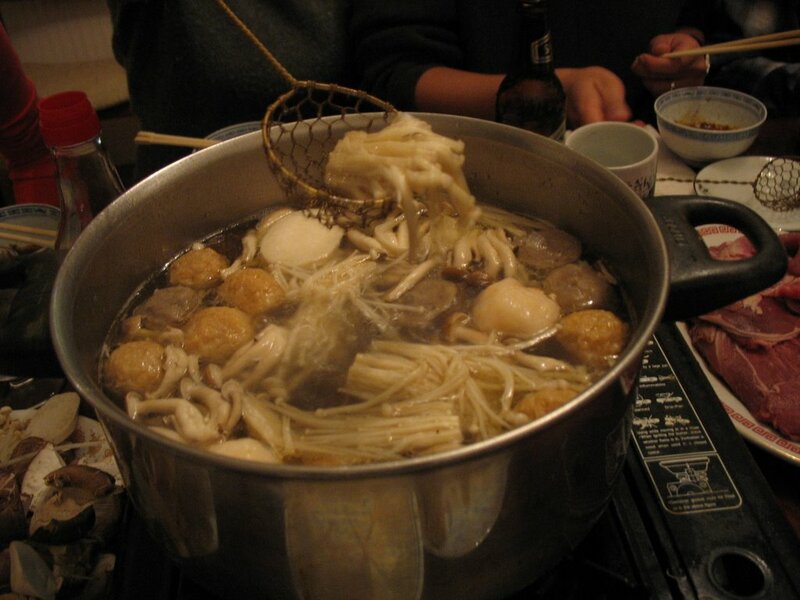 Often, there would be a number of people standing up, looking into the pot as they swi shed their little nets through the broth, looking for an elusive chunk of tofu or a muscle that had sunk to the bottom. All of this was accompanied by many varieties of beer, including my new favorite, Hoegaarden, as well as lots of laughing and conversation. After about an hour and a half of eating (seriously! ), many of us began to fall into a food stupor. And yet, we kept on eating. In high school, we never were the types to have wild, drunken parties. Instead, we ate tons of food until we passed out — and then woke to eat the leftovers. True foodies since the beginning. Once we had stuffed ourselves silly and the table was cleared, Anna brought out chunks of watermelon, as well as some mangosteens. Imagine my surprise to see them! I had fallen in love with their flavor while traveling in Thailand last year and had thought they were illegal to import. Anna said they had been previously frozen — which was too bad because that seemed to be the death of them. They wouldn't even yield to being torn open by hand. Everyone who tried one used a knife — except me, who insisted that I could rip it open and was rewarded by the fruit shooting out of my hand and onto the floor. Upon prying them open, we found them to be bitter and foul-smelling. Mine smelled like rotten fruit, and a tentative touch of my tongue to the unfortunately grayish flesh revealed it to taste pretty rotten, too. Despite that, a good time was had by all. 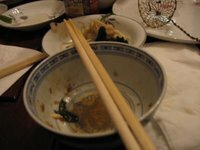 I left feeling full of beer and food — as well as a sense of comraderie that comes with eating in such a communal fashion. 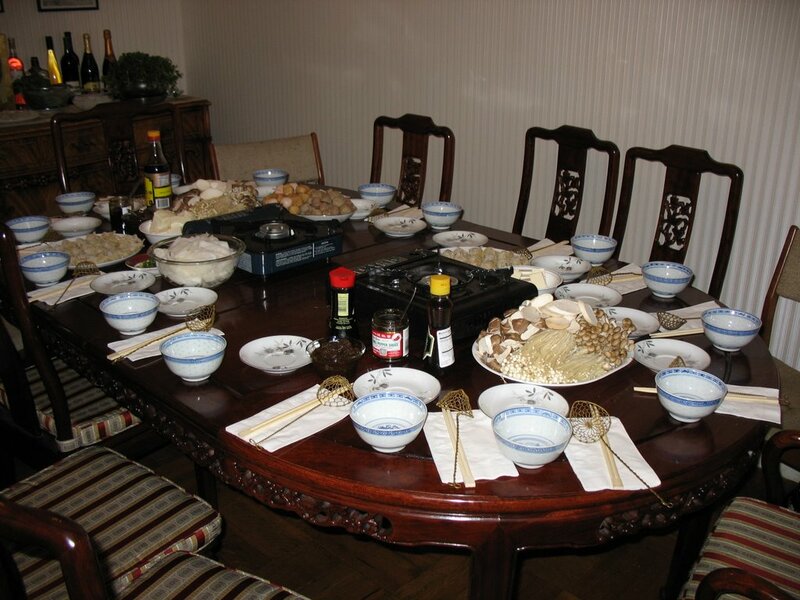 By the time my stomach started growling from hunger the following morning, I was already wishing I could have more hot pot and wondering what these friends of mine might have up their sleeves for the next time we get together as a group.